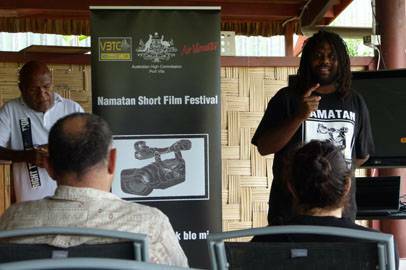 The Namatan Short Film Festival 2015, a festival created for the ni-Vanuatu to express their ideas and their creativity through film, was launched. Namatan is now in its fourth year. In 2014, the finalists' films were shown to over 3,000 people in communities around the country and screened on national television. The festival promotes a unique item each year. This year, each film must contain two spinning coins reflecting the game of two-up, to commemorate the 100-year anniversary of the ANZACs' landing at Gallipoli during World War One. The spinning coins also symbolise ‘choice' - that everyone has to make choices about their own path in life.